Born in Belfast, Ontario on September 5, 1882, Charles Agar was educated in Ontario before he came to Saskatchewan in 1905 to farm. Becoming active in several farmers’ organizations, Agar like many other farmers, gravitated towards the Progressives after the First World War. He first ran as a Progressive in the 1921 election in the constituency of Saskatoon County and was narrowly elected. Re-elected as a Progressive in 1925 and like many Progressives, gravitated back towards the Liberals. In 1927 Agar was convinced by James Gardiner to cross the floor and sit as a Liberal. Contesting the 1929 election, this time as a Liberal, Agar was again re-elected, ironically enough because the Progressives did not endorse his Conservative opponent as they had in many places throughout the province. After spending a term in opposition, Agar was elected in the constituency of Hanley in 1934 as the Liberals swept back to power. In 1938, with the defeat of the current speaker John Parker, Agar became speaker due to his long experience in the house. 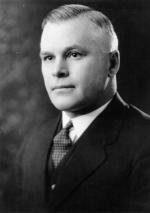 Agar presided over the legislature for six years until 1944 when he was defeated by CCF candidate, James Aitken. Agar retired from politics, and died in Saskatoon in January 1961.